18" extra strong bungee cords with plastic coated steel hooks. Attached to mounting points, such as motorcycle luggage hook or secure parts of the frame, 18 inch bungee cords are a cheap way of carring luggage on a motorcycle. 24" extra strong bungee cords with plastic coated steel hooks. 24" extra strong bungee cords plastic lockable heads. 30" extra strong bungee cords with plastic coated steel hooks. 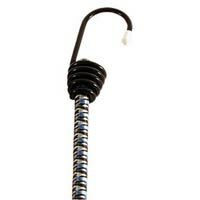 30" extra strong bungee cords plastic lockable heads. 36" extra strong bungee cords with plastic coated steel hooks. 36" extra strong bungee cords plastic lockable heads.